Summary allow you to have a quick overview of all important component of kontact. The Calendar section will pick up and display all your appointments, and you can select one day or a month as the period to be displayed, or you can choose the number of days yourself. Your ToDo entries can also be displayed. 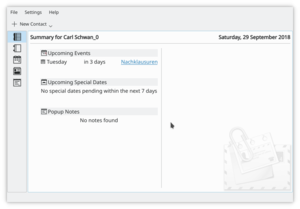 This time you have the option of displaying all ToDo entries or only those related to today. The Special Dates Overview screen allows you to set the display of birthdays, anniversaries, holidays and other special events. You may well not need all your Email accounts listed on the summary page, but you can choose to have the ones most likely to have urgent messages. The display will give you the mailbox name and the number of unread/total messages. 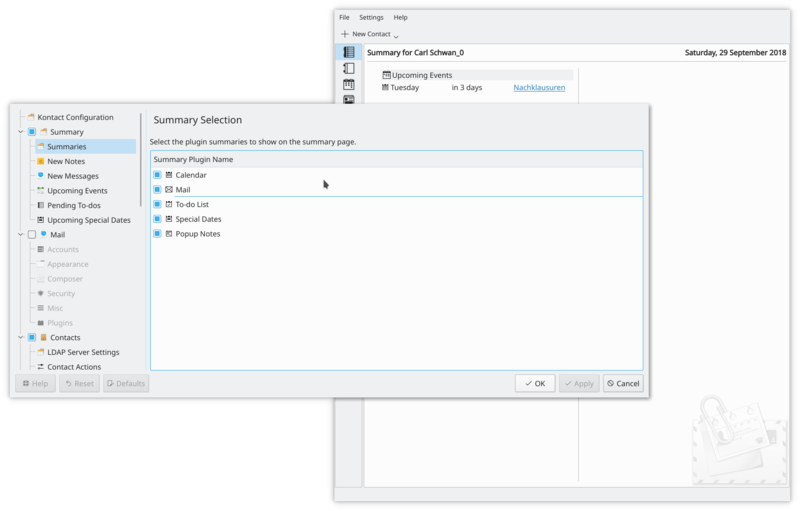 Finally, your KNotes can also be displayed on your Summary page. All these components can be re-arranged by dragging them around the screen. All these components can also be removed in the kontact settings. This page was last modified on 20 January 2019, at 18:27. Content is available under Creative Commons License SA 4.0 unless otherwise noted.